Mini anything is cute! Individual bite size treats. These little delights are the perfect size to pop in your mouth with one bite. Less mess, right? Personally, I am a two-bite taster. First bites are usually examining what I just ate, looking at the mini’s texture and determining the taste. Second bite is to savor and enjoy. Peanut butter is one of my loves! I just had a conversation with my oldest son, Joe, about how I ate a ridiculous amount of peanut butter during my pregnancy with him. He, however, is not a fan of peanut butter. How can a kid of mine not like peanut butter?! 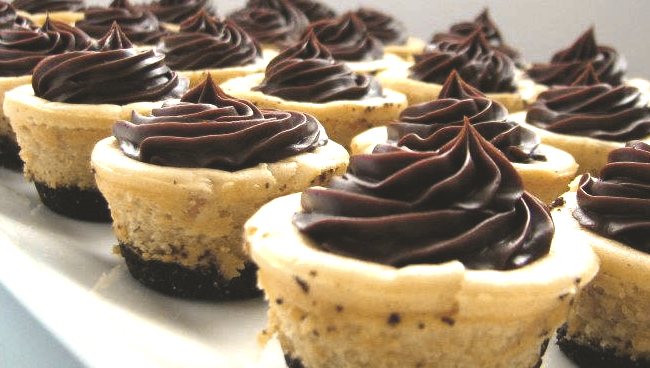 The creamy texture and the balance of peanut butter to chocolate ratio will blow you away! Warning, you won’t be able to stop at one; that’s ok.
Preheat the oven to 350˚F. Lightly spray a 24-inch mini muffin pan with cooking spray. Combine the chocolate cookie crumbs; melt butter and sugar in a small bowl. Mix with a fork until evenly blended. Divide the crust mixture between the wells of the prepared pan, about 2-3 teaspoons in each. Press the crumb mixture into a flat layer on the bottom of the well (the bottom of a shot glass works great). Bake for 10 minutes. Transfer to a wire rack. Combine the cream cheese, sour cream and peanut butter in the bowl of an electric mixer. Beat on medium-high speed until smooth and well blended. Add in the sugar and mix until incorporated, about 1 minute more, scraping down the sides of the bowl as needed. Blend in the egg and egg yolk, vanilla and salt. Continue to beat until the mixture is completely smooth. Divide the mixture evenly over the cookie crumb crust and smooth the tops slightly. Bake just until set, about 22 minutes, rotating the pan halfway through baking. Transfer to a wire rack and let cool to room temperature. Once completely cool, transfer the pan to the refrigerator and chill thoroughly, at least 3 hours. Once the cheesecakes are well chilled, carefully remove them from the pan (run a knife around the edges to loosen). In a small saucepan, bring the cream to a simmer over medium heat. Once simmering, remove from the heat and immediately pour over the chocolate. Let stand 1-2 minutes. Whisk in small circular motions until a smooth ganache has formed. Whisk in the butter until completely incorporated. Let the mixture stand at room temperature until slightly thickened for piping onto the cheesecakes. (Speed this process in the refrigerator or freezer, but be sure to whisk every 10 minutes or so). Once the ganache has thickened, transfer to a pastry bag fitted with a decorative tip and pipe onto the cheesecakes. Cover and refrigerate until the ganache is set. Amy, These look amazing! I have a weakness for chocolate and peanut butter. I will definitely have to try these. Thanks for sharing. Nice Website!